This Key Lime Layer Cake starts with a box of cake mix, so before I share the recipe I have to address the topic. A standard box of cake mix used to be 18.25 oz, but cake mix has been reformulated and most boxes now hold between 15.25 and 16.5 oz of mix depending on the brand. A few months ago you could still find 18.25 oz boxes of certain flavors of Duncan Hines, but I’ve searched high and low over the past two weeks and the 18.25 oz boxes have disappeared completely. So what does this mean for all those old doctored cake mixes that call for the 18.25 oz boxes? Options are to 1) add 1/3 cup of flour to make up for the missing cake mix 2) buy two boxes of mix and weigh out just enough of the second box to make 18.25 oz total or 3) do nothing and just use the smaller size box. 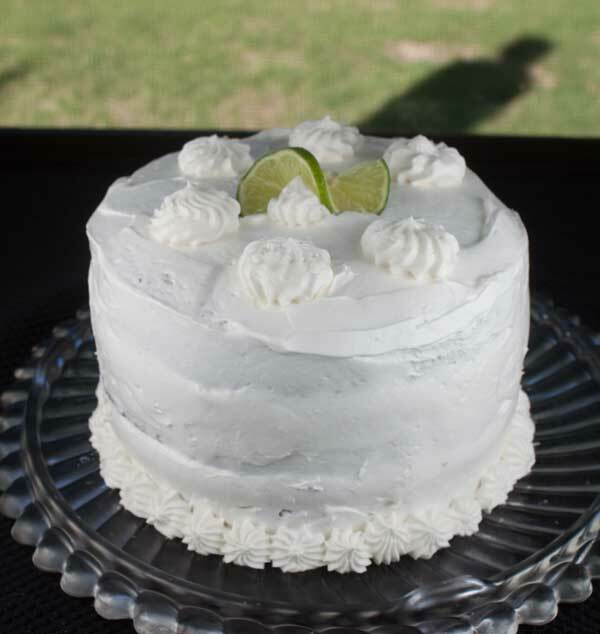 For this Key Lime Layer Cake, I used a recipe that originally called for 18.25 oz of lemon cake mix. Before making the cake I did one more search for the 18.25 oz box thinking maybe there’d be some holdover Duncan Hines Lemon Supreme at a certain store. No luck. Of the three options listed above, I went with #3 and used the 16.5 oz box without making changes. Well, almost. The original recipe called for a full 1 1/3 cups of oil. Thinking it was a misprint, I checked other sources and found some bakers used the full amount of oil while others used less. To get to the bottom of how much oil the cake needed, I tested the cake two ways. I made one layer using the full amount of oil and the other two layers using half. All three layers baked up nicely, but the layers made with less oil were fluffier. The frosting was interesting, too. It started out a little grainy from the granulated sugar, but as the cake sat the sugar dissolved and the frosting became smooth. I usually don’t post pictures of the full cake since I’m not the best decorator, but this one’s kind of funny. The chimney cast a shadow and it looks like there’s a burglar hiding out in the backyard! Here’s the recipe. My source was Texas Co-op Power. 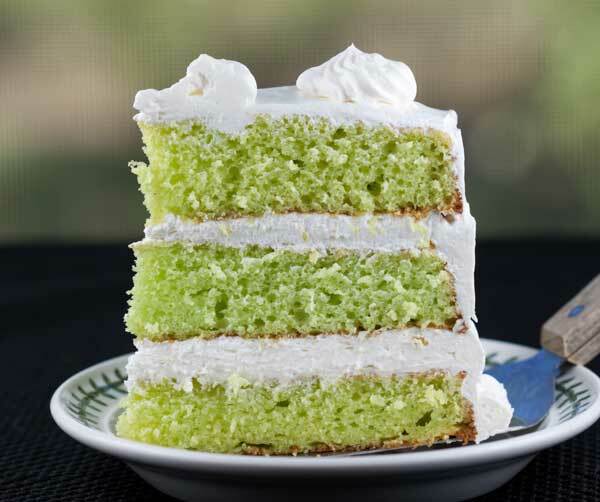 If you’re in the mood for a scratch cake, there’s also a scratch version of the Key Lime Layer Cake. Here’s how I made it. A cake mix based Key lime cake that starts with a box of lemon cake mix. Preheat oven to 350 degrees F. Grease and flour three 8 inch round cake pans or spray thoroughly with flour-added baking spray. 9 inch pans may be used as well, but the cake will be shorter. Mix the cake mix, Jell-O, oil, orange juice and eggs in a large bowl and beat well with an electric mixer for about 2 minutes. Pour into pans and bake for 20 to 23 minutes or until a toothpick inserted comes out clean. Let cool for about 10 minutes in the pans, then remove layers from pans. Mix together the lime juice and powdered sugar and spoon over the cake. Let it cool completely. To make the frosting, mix together cream cheese and sugars and beat with an electric mixer until smooth. Fold in the whipped topping. You can use the full 16 oz or use less to taste. Spread the icing on top of the cakes, then stack and spread it all over the sides. If you feel like it, pipe icing around the edge and garnish with limes. You can always swap out the whipped topping with lightly sweetened whipped cream. I hadn’t noticed the size change in cake mixes…interesting. There are a lot of recipes I love that call for the (old) standard size. I wonder how my favorite gooey butter cake will compare? That’s a beautiful cake! It’s good to know that less oil makes it fluffier. If you find it, you might want to stock up and freeze it for the holidays. I’m guessing that size won’t be around much longer, but I do not really know. I bought Duncan Hines lemon mix today… 18.5 … on sale at small local grocery for $1. Bonnie, you could leave the powdered sugar and out and just drizzle some lime juice over the baked cake layers or you could try using lime juice in place of some of the orange juice. I think both things would add a little more lime flavor. If you really want to pump up the lime flavor you could add some lime zest to the batter. Just thinking about the added sugar for the flavour glaze…could one not just add the lime juice and add the oj to the required liquid for the mix instead of adding yet more sugar to the cake…. Such a pretty cake! The changing of box sizes is one of my pet peeves too. I don’t make box cakes often, but when I do I like to doctor them up and most of my recipes want the bigger size. Thanks Kathleen! It really is a treasure trove of recipes. Hope you find a few you like. Your cake is beautiful. That looks like a fun recipe. I checked out the Texas Co op Power web site and they have some good sounding recipes.